The AEC Reliance ultimately became the biggest-selling single-deck chassis in the manufacturer's range. 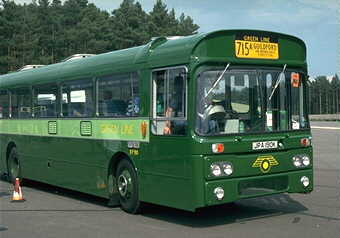 The model first appeared in 1929, and the first operator was EAST SURREY. Originally front-engined, it metamorphosed in 1953 with a mid-mounted, horizontal engine under the floor. A new air-operated epycyclic gearbox soon followed, with its diminuitive MONOCONTROL operating lever. London Transport was full of new Regals (RF) and didn't take any until 1965, when fourteen entered service in an attempt to revive the tired Green Line image. The RC class as they were known were finished in a reversed colour scheme, and featured heavily in corporate publicity. However, they were not a success operationally and spent a long time off the road before being demoted to bus work around the network. By the end of the sixties, it was obvious that the much-loved Routemaster coaches were an expensive liability with their two-man crew, and a new batch of 90 Reliances were ordered to replace them. They were the first new vehicles obtained by London Country. They, too were not a huge success, being unreliable (despite the name and superlative pedigree) and were demoted to bus duties or retired by the late seventies. New Reliance coaches replaced the entire Green Line fleet. When they appeared on the 716 in Hitchin I thought they were the finest vehicles on the road. The style was very clean without being ornate, the blue-green moquette was beautiful, and the engine sounded aggressive and confident. I could hardly afford the fare - a Golden Rover was 75p - but Sunday jaunts could be bought at bus rates. More affluent, with a Saturday job at Boots the Chemist, I travelled far and wide on these transports of delight. To ride RP90 at Classic Automotion 1997 was therefore very nostalgic. A total of four RPs are known to survive - RP21, 25, 71, 90. This latter is a stalwart performer at Cobham events, and regularly makes extended tours.